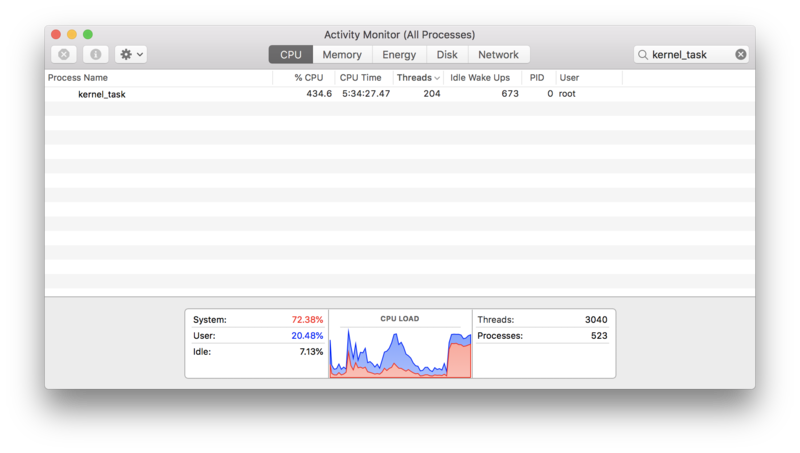 A MacOS process called “kernel_task” uses an insanely high amount of your CPU and your system freezes up. This happens apparently at random. I found a ‘fix’ that reliably alleviates the problem for me. As soon as the CPU usage starts peaking and the system starts lagging, disconnect the Apple laptop’s power supply immediately and within a minute the system should become usable again – the CPU usage will go back down. Then reconnect the power supply and continue charging as before. This isn’t really a total solution. 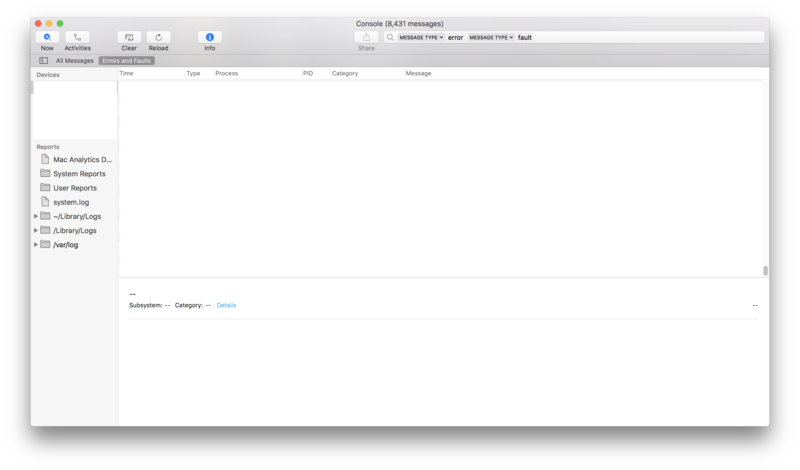 Apple needs to sort its operating system out. But at least this works as a kind of fix or workaround. It stops the malfunction in its tracks so that the system can at least recovery rapidly back to normal use. It stops the CPU usage peaking and locking up your system! For a few months, up to 3 times a day, I was experiencing a freezing of my system whereby an unknown task or process was hogging CPU usage. During these events, the system would all but totally freeze out and only work in slow motion. Sometimes restarting the computer would help; other times it wouldn’t help. The high CPU usage and the resultant system slowdown and freeze would actually last for anything from 5 minutes to 30 minutes. This was a total nightmare as it could happen at any time and be extremely disruptive to my workflow. I obviously did the normal online research and tried as many known solutions as I could. There are many solutions online for how to fix this well-known ‘kernel_task’ issue, but none worked for me. Over the months, in total, I spent days trying to diagnose what was causing the problem. Using Activity Monitor to try to find what process was causing the high CPU usage. I even quit processes one by one to see if one was causing the problem. No luck. PRAM and SMC resets didn’t work. Trying a reboot into Safe Mode: sometimes, the issue still persisted in Safe Mode. I tried uninstalling my antivirus, password manager, and other programs with heavy background usages in case they were causing the system freeze. No joy. I tried disabling Bluetooth, as for some it’s all Bluetooth-related. Monitoring the Console for Errors in real time. Nothing relevant seemed to be logged. Other more advanced diagnosis methods when the system is freezing up. So I had spent months trying to diagnose. Once I’d done the PRAM and SMC resets, saw that the problem persisted with WiFi and Bluetooth turned off, even in Safe Made, I started to give up trying to diagnose the problem. But by this point in the saga I was still keeping Activity Log and Console open all the time for monitoring. One day when the system was frozen up, while I working in a cafe, someone knocked my power supply from the wall socket. I saw that the loss of power to the MacBook Pro actually stopped the kernel panic and the system rapidly unfroze. At that time were no relatable errors in the Console, and nothing was really changing dramatically in Activity Log. I had eye on the CPU usage in those very moments and I was able to see the ‘coincidence’ between the power being disconnected and the CPU usage returning to normal. It’s ironic that it was some kind of human error that helped me diagnose a way to ‘fix’ the nightmare issue. I don’t know if it’s the same on your Mac, but on mine when the computer is running on battery power and is about to die, while it is preparing for hibernation a similar CPU issue occurs. When remaining battery power approaches 1-2%, the system prepares for hibernation and it starts freezing up and my apps become pretty unusable. I think it’s some kind of ‘RAM writing to disk’ that sees the slowdown. This slowdown is the same kind of slowdown that happens with the kernel_task nightmare. For me, this is more evidence of how, on my system at least, there is a relationship between the system freezing up and power and charging related conditions. It’s been a few days now of using this ‘Disconnect Power’ hack to fix the CPU usage spiral, and it’s been effective 100% of the time. I hope this might help you too. My system: MacBook Pro (2017) running the latest macOS High Sierra 10.13.5.